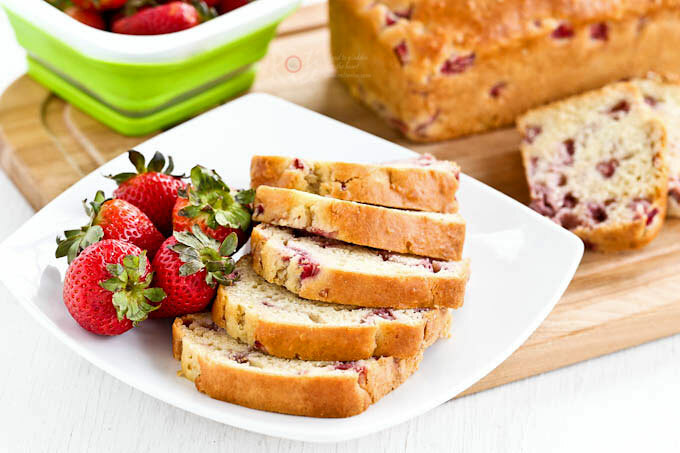 This lovely Strawberry Cream Cheese Bread has a super moist and creamy texture. A must-bake when strawberries are in season! It’s strawberry season and one can’t help but pick up a punnet or two at the grocery stores. Strawberries are great in smoothies, ice cream, salad, scones, bars, and even in a grilled cheese sandwich. It has been a while since I last made a loaf of bread and so this time round, I decided to make two small loaves of Strawberry Cream Cheese Bread. I am glad I did. This is not my first time making strawberry bread but adding cream cheese in it is a first. I really like the texture of this Raspberry Swirl Cream Cheese Pound Cake and so I figured it will work just as nicely in a quick bread. It did and I could not be more happy at the way it turned out. I simply chopped the strawberries before adding them to the batter. They can also be pureed instead, like what I did in these Strawberry Cupcakes. Either way is fine. The two small loaves worked out nicely for us. We finished one loaf and froze the other for later. It would also make a nice gift for a friend or neighbor. 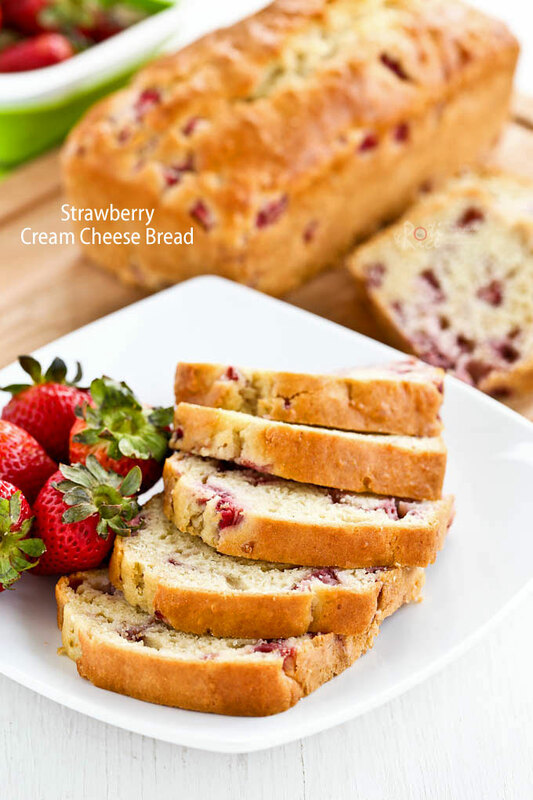 I hope you will give this Strawberry Cream Cheese Bread a try soon while strawberries are still aplenty out there. Grease and flour two 7½ x 3¾ x 2¼ inch or one 9¼ x 5¼ x 3 inch loaf pan. Preheat oven to 350˚F (180°C). Combine all purpose flour, baking powder, and baking soda in a medium sized bowl. Cream butter, cream cheese, sugar, and salt in a large bowl until light and fluffy, about 2 minutes. Add flour mixture, buttermilk, and chopped strawberries. Stir until just combined. Pour batter into prepared pan(s). Bake for 50 minutes (if using two 7½" x 3¾" x 2¼" loaf pans) to 1 hour (if using one 9"x5" loaf pan), or until wooden pick inserted in the center comes out clean. If the top is browning too quickly, place an aluminum foil tent over bread. Thanks Laura! Yes, frozen strawberries would work. Once complete, the batter has almost a pound cake texture – looks good. Hope to have positive feedback from the co-workers tomorrow. Hi Dave! Sorry for the missed out steps and thanks for pointing it out. Not sure what happened cause they are in my Word recipe on my PC. I probably did some editing (late at night) while loading it here and accidentally deleted some words and lines. Good thing the steps are all in the video. Hi Lind, could I replace buttermilk with plain milk? I wanna tried your recipe but do not have any buttermilk right now. Thanks. 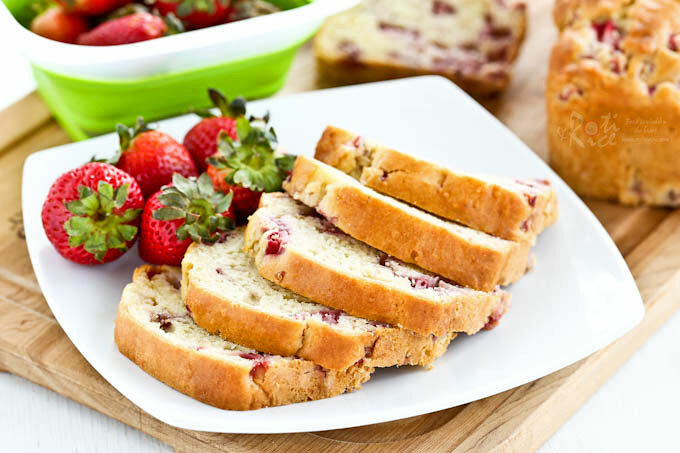 Hi Linda, your Strawberry Cream Cheese Bread recipe was so delicious. One question please? Did you refrigerated this bread? Coz I baked this bread on Tuesday and I realized it started to spoil on Thursday. It should be able to keep for a day or two unless you live in a warmer or more humid climate. If that is the case, you can keep it in the refrigerator. Strawberries deteriorate quickly when it is warm. Best to freeze if you intend to keep it for longer. My goodness is this yummy! We made this tonight, and used my mini loaf pan. It made almost a dozen loaves, and came out perfect in 30 mins. 🙂 This is definitely being added to my favorite quick bread recipes. Thank you! Hi Linda, the recipe was great, I used blueberries instead of the strawberries and it was delicios great with a cup of coffee.